New York Model Management's Brogan Loftus is the perfect antidote to the assembly line of cookie-cutter beauties that fall inevitably by the wayside in the aftermath of each show season. Aged nineteen and hailing from Yorkshire, England, Loftus is impossible to overlook given her lanky 180 cm frame, one-of-kind off-kilter features, and a provocative devil-may-care runway demeanour. Indeed it is those glaring physical and personal attributes which led to Loftus being scouted at age twelve while shopping in her hometown. Loftus was catapulted into the modelling spotlight as she made her international runway debut at the Spring/Summer 2014 collections, opening for Céline. Loftus proved her runway mettle more recently during her first full Fashion Week at the Fall/Winter 2014 collections, playing model as muse while treading the runway for Alexander Wang, Chanel, Fendi, Maison Martin Margiela, Julien Macdonald, and again at Céline. With her furrowed brow line, inquisitive piercing green eyes, and a curled upper-lip that offers devilish glimpses of a Joker's smile, Loftus displays a strikingly similar cerebral aesthetic that challenges notions of beauty as evoked by industry icons Guinevere Van Seenus, Stella Tenant, and Karen Elson. Loftus has already appeared in editorial shoots for Grit, Harper's Bazaar Singapore, and Miss Vogue, in addition to a Spring/Summer 2014 campaign slot for McQ lensed by Steven Klein. 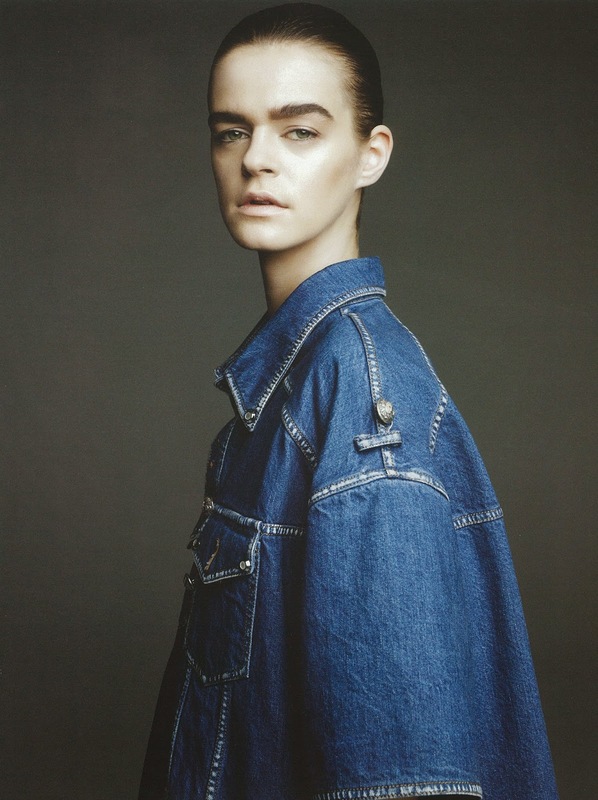 Equally alluring are Loftus' super-chilled approach to modelling, her seemingly lack of awareness of her stunning physicality, and a refreshing candour that she displays which at first seems at odds with her brooding, androgynous beauty. Loftus kicked back in between Resort 2015 castings to chat exclusively with IMA about her stunning Fall/Winter 2014 season, catching up with Kanye West backstage at Céline, her approach to keeping a healthy work/life balance, and why British girls are tearing up fashion's runways. Inoubliable Model Army (IMA): Hi Brogan, thank you for chatting with IMA! 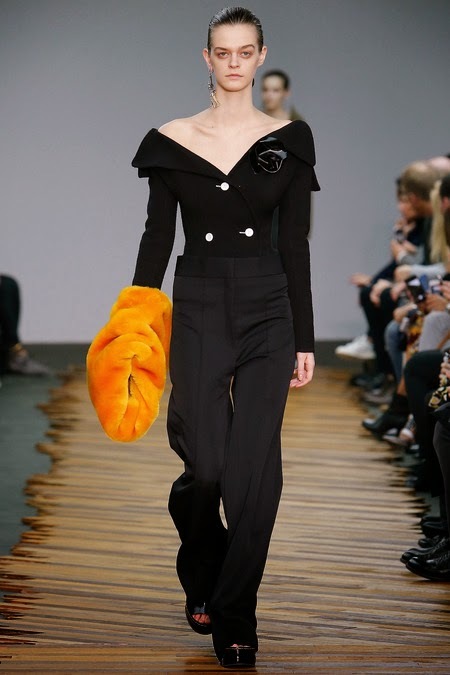 Following an auspicious debut at the Spring/Summer 2014 collections which saw you opening for Céline, did you feel a degree of pressure heading into your first full show season at the Fall/Winter 2014 collections? Were you content with how the season developed? Brogan Loftus (BL): Hellooo! It was incredible to have the chance to do a full Fashion Week and to go to New York since I had never actually left Europe before. It was such a good season for me. It was very lucky and amazing I got to do the Céline show again as that is where it really started for me. IMA: As a relatively new face, would you mind sharing your backstory with IMA? BL: I'm 19 years old and come from the best/friendliest place in England, Yorkshire! I've lived there all my life as have all my family. Both my mom and dad's grandparents live in the same village near York as us. I was first scouted at age 12 in my city of York in a shop. At the time I didn't think much of it but having always been tall and skinny it was something people regularly suggested to me. IMA: You truly have one of the most distinctive and memorable faces among the new generation of models, with slightly off-skew features which fit perfectly together. Were you conscious of your beauty growing up or was it a case as with many models of growing into your beauty? IMA: During the Fall/Winter 2014 season you booked an impressive 17 shows, commencing with Alexander Wang and finishing with Chanel! Are you able to pinpoint any pivotal moments either on or off the runway which you will forever cherish? BL: All of the shows I did were such an honour and a blessing, especially brands that I love myself like Chanel, and definitely having the opportunity to do Céline again. But my favourite memory is meeting Kanye West after Céline, I bloody love him! IMA: British models have been killing it on the runway these past few seasons with yourself, Hollie-May Saker, Edie Campbell, Sam Rollinson, Betty Adewole, and Malaika Firth representing. What is it about Brit girls that has the fashion world so enamoured? BL: All the British girls I've met I've loved, even the Supers like Jourdan Dunn and Cara Delevingne are ridiculously nice and easy-going and I think that's why we do well. People want to work with other people who enjoy themselves and can have a good laugh. 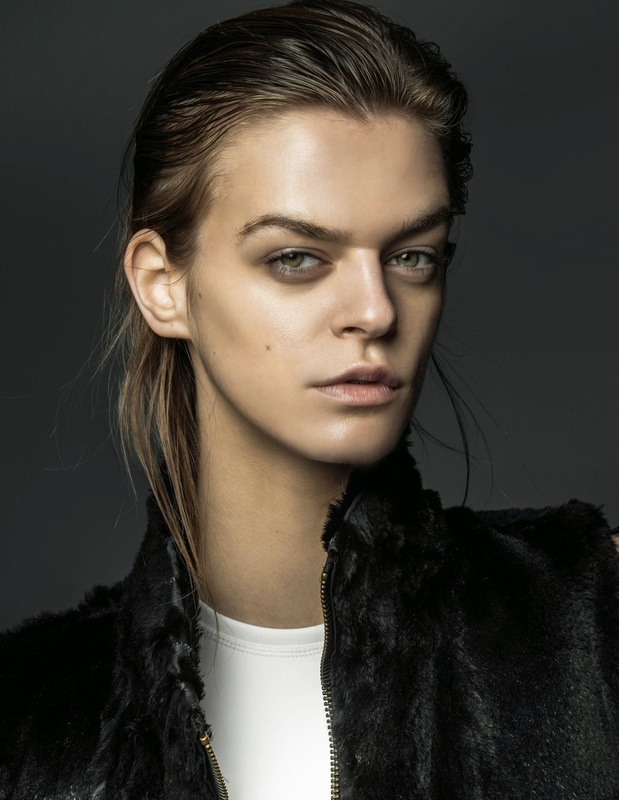 IMA: For many girls modelling is a dream that they aspire to growing up. 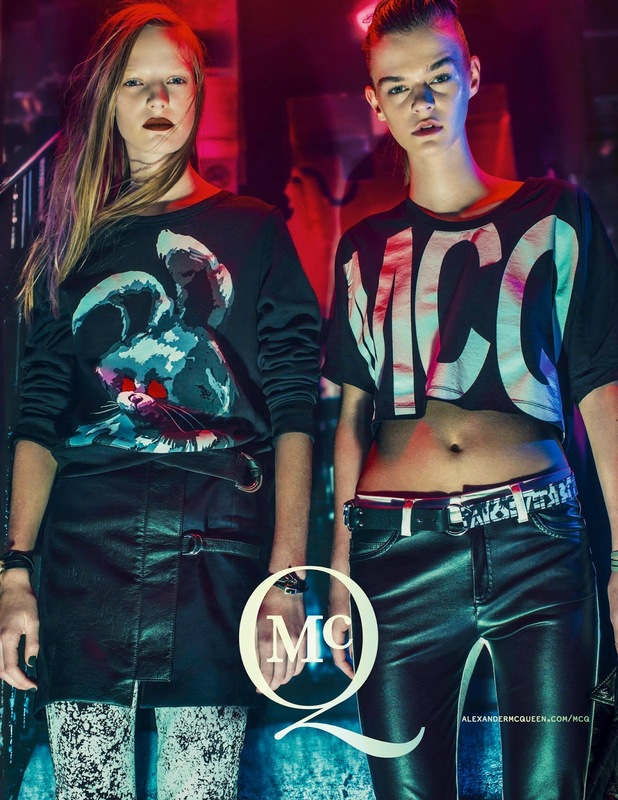 What has surprised you most about the modelling and fashion world in your adventures as a model? BL: To be honest, I'm mostly surprised at how difficult it is to be a model or designer, I'm pretty sure half the people in the industry unlike me, are capable of living without sleep - literally my nightmare! IMA: You've posed for Steven Klein for the McQ Spring/Summer 2014 campaign and tested with Bryan Whitely, Tom Betts and Adam Fussell, while also appearing in editorials for Grit and Harper's Bazaar Singapore. What do you enjoy and find most challenging about the print component of modelling? BL: The print side of things for me is a lot easier because I don't have to walk anywhere and just get fed all day = Heaven ;-). But still it can be tough when you're asked to do a lot of movements to make the pictures look good and still keep a relatively attractive face while jumping in the air! IMA: The modelling world and the way models are perceived has been drastically affected by the amount of digital retouching and airbrushing of print images. Have you gotten used to seeing yourself in magazines and do you feel that the fashion industry perpetuates an unrealistic beauty ideal for women and particularly young girls? BL: It's still insanely bizarre to see myself in a mag but I love it. It's more rewarding for me that also my friends and family will see it and buy it to be supportive. I've been fortunate enough to see some of the supermodels in real life and they are just as stunning in person, pretty sure I was staring a little too much half the time backstage! IMA: Modelling is a highly competitive field with a continual influx of new faces each show season. What are your expectations as an aspiring model and what other professions do you see yourself pursuing in the future as a back-up to modelling? IMA: Behind every successful model is a battalion of agents and bookers who carefully and strategically chart the course of a model's career trajectory. Having signed to New York Model Management earlier this year, what do you appreciate most about NYMM's management approach and what was the most salient piece of advice your agents offered you leading up to the Fall/Winter 2014 shows? BL: The NYMM team is amazingly hands on and very involved with their models. They are not only there to book you jobs but to also understand that you need emotional support sometimes being away from home etc., a talent often failed to have in the industry. Best advice given - expect to be exhausted and want to cry. IMA: Having participated in your first full Fashion Week, did you notice a difference in the fashion aesthetic in each of the four major fashion capitals. Was there a city out of the four that you felt more connected to? BL: Fashion is different wherever you go. For me. Paris is the ultimate ideal of 'classic beauty and fashion'. However, I'm bias and have to say London is my favourite because everything is more edgy, cool, and FUN. IMA: Of the many new faces that you encountered at casting, shows, and backstage, which girls did you bond with most? BL: I love girls that don't take themselves or the job too seriously. My favourites are Hollie-May Saker, Georgia Taylor, and other British girls I've met like Charlotte Wiggins and Sam Rollinson; we all seem to have the same immature (but hilarious) humour. But I actually haven't met one girl I disliked at all, everyone has been so nice to work with. IMA: Beauty is very much in the eye of the Beholder! If you had to pick one model amongst the Fall/Winter 2014 new faces, which in your mind blew you away with her beauty? BL: I think all the girls are amazing, I can't actually say I have a favourite. For me, if she is cool and laid-back, then she's a killer. IMA: IMA hears that you're a major Chris Brown fan! What do you appreciate most about Chris Brown as an artist and how would you react if you caught a glimpse of him while walking down the runway? BL: I'm a sucker for anyone who can dance or sing like him. He's just so cool in his own ways and R&B and hip-hop are my only genre choice of music so basically he's just incredible to me. If I saw Chris Brown while walking the catwalk, I genuinely think I may have to stop half-way and ask him for a quick picture... or I would faint even before asking the question!